FRANCE: Areva has agreed to invest EUR 5 million in Nénuphar, the Lille-based company behind the Vertiwind vertical-axis floating wind turbine. Areva will also bring its experience in offshore wind and industrial expertise to help develop – and possibly manufacture – the Vertiwind turbine. Under the terms of the agreement, Areva could increase its stake in future. At the same time, the Ecotechnologies Fund, managed by the state-owned investment bank BPi France, and Nénuphar's original backers Idinvest Partners also agreed to invest EUR 5 million each. As a small start-up, Nénuphar needs the capital injection and industrial partners to develop the technology, CEO Charles Smadja explained. French engineering firm Technip and renewable energy company EDF Energies Nouvelles are already partners in the Vertiwind project. 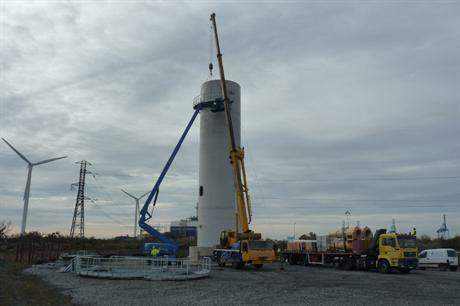 The 2MW onshore prototype has now been installed at a test site at Fos-sur-Mer on the Mediterranean, and is expected to be officially launched at end-May or early June, Smadja said. The plan is to erect an offshore prototype late 2015, followed by a pilot project of 13 turbines 23 kilometres off the Mediterranean coast the following year.